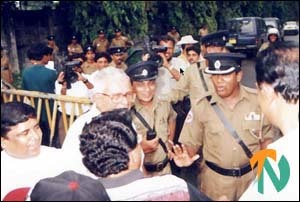 A group of about thirty United National Party MPs were blocked by the Sri Lankan Police from staging a protest this morning at Independent Square near down town Colombo against the promulgation of the draconian regulations under the Public Security Ordinance. These regulations severely curtail freedom of expression and assembly and provide immense powers to the Sri Lankan government to seize private assets and close down news papers. The MPs were stopped from protesting under the sweeping powers given to the Police by the new regulations of the Public Security Ordinance (PSO). A large number of UNP supporters who were expected take part in the protest today failed to turn up due to uncertainty about the consequences of the PSO regulations said one of the protesting MPs. Meanwhile the leader of the Opposition, Ranil Wickremasinghe, met the Sri Lankan President Chandrika Kumaratunge today in the fourth round of the ongoing talks between the main opposition party, the UNP, and the ruling PA, over the proposed constitutional reforms to find a solution to the ethnic crisis. In a joint communique released today, the UNP and the Government said they agreed on provisions relating to Buddhism,language, citizenship, appointment of chief ministers to the regions and the regional judiciary. It added that the provisions regarding appointments to the supreme court have to be re-examined. The government and the UNP would meet again on May 11. The government delegation comprised of the minister for agriculture and land, D.M Jayaratne, Dharmasiri Senanayake, Minister of civil aviation and tourism, M.H.M Ashraff, Minister of ports, reconstruction and rehabilitation (east) and Minister of science and technology Batty Weerakoone. The UNP delegation was led by its leader Ranil Wickremasinghe. He was accompanied by the general secretary of the party Gamini Atukorale, and party chairman Karu Jayasuriya.